The forces which bring about evolutionary changes by natural selection are called evolutionary forces. These forces are random genetic drift, gene flow and mutation. The change in gene frequencies by chance is called genetic drift. Chance plays an important role in maintaining a gene in a population. Chance becomes more significant in a smaller population. Chance encounters reproductive individuals. Thus it promotes reproduction. Some traits of a population do not survive. But they come in the gametes by chance involved in fertilization. Chance events influence the frequencies of genes in populations. It causes genetic drift. The gene frequencies are changing independently of natural selection. Therefore, genetic drift is called neutral selection. The process of genetic drift is similar to flipping a thin coin. There is equal chance of getting a head or a tail. There are almost 50:50 ratios of heads and tails in large number of tosses. The ratios are disproportionate in only 10 tosses. The ratio may be a 7 heads and 3 tails. Similarly, there are two equally adaptive alleles. One of these two alleles incorporated into a gamete by chance. Therefore, it is transferred into a second generation. Thus both alleles have equal chance.But meiosis causes unusual. proportions of alleles in gamete in a small population like tossing a coin. Suppose both alleles have equal fitness. These chance events may increase or decreases frequency of a particular allele. Genetic drift in a new colony is called founder effect. For example, a few individuals from a parental population colonize new habitats. They do not carry: all the gene pool of their parental population. The founding individuals develop new colony. It has a distinctive genetic makeup. It has far less variation than the larger population. The variation in gene frequency between the original population and colony may also trigger the two groups to diverge significantly. The variance or genetic distance increases between them. Therefore, the two separated populations may become distinctively different, both genetically and phenotypically. This potential for relatively rapid changes in the colony’s gene frequency led most scientists to consider the founder effect (and by extension, genetic drift) a significant driving force in the evolution of new species. Sewall Wright was the first to attach this significance to random drift and small, newly isolated populations with his shifting balance theory of speciation. Following behind Wright, Ernst Mayr created many persuasive models. These models show that the decline in genetic variation and small population size accompanying the founder effect. These changes were critically important for new species to develop. Northern elephant seal is also an example of bottle neck effect. They were hunted to near extinction in the late I 800s. Law was enacted in 1922 to protect the seal. Now their population is greater than 100,000 individuals. But they have low genetic variability in the population. The effects of bottlenecks are contioversial. 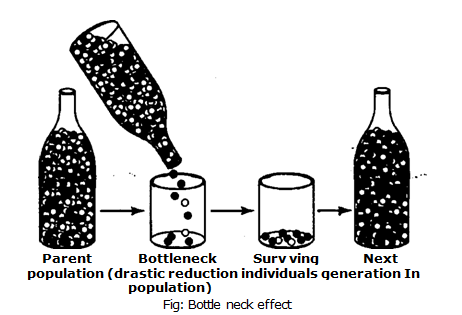 The traditional interpretation is that bottle neck effect decreases genetic diversity of populations. This population cannot withstand environmental stress. Therefore. they become extinct. If one population has high genetic diversity, its individuals have combination of’ gene*, These gages help them to withstand environmental changes. Changes in the structure of genes and chromosomes are called mutations. The Hardy-Weinberg.theorem assumes that no mutations occur. Or mutational equilibrium exists in the populations. However mutations are a fact of life. Mutations are the igin of all new genes. They are source of variation. These variations may prove adaptive for an animal. Mutation counters the loss of genetic material from natural selection and genetic drift. It increases the chance of variations in the population. These variations allow a group to survive in future environmental shocks. Mutations are always random. All mutations are not useful. Organisms cannot filter harmful genetic changes from advantageous changes. The effects of mutations vary enormously. Most mutations are deleterious. Some mutations are neutral. Some mutations are harmful in one environment. But help an organism to survive in another environment. The evolution of ecological and phenotypic diversity within a rapidly multiplying lineage is called adaptive radiation. It starts with a recent single ancestor. This process results in the speciation and phenotypic adaptation of species. These species exhibiting different morphological and physiological traits. Thus they can exploit a range of divergent environments. Adaptive radiation can be graphically illustrated as a bush, or clade, of coexisting species on the tree of life. A common ancestry of component species: specifically a recent ancestry. a significant association between environments and the morphological and physiological traits used to exploit those environments. The evolution of a novel feature. It may permit a clade to diversify by making new areas of metamorphose accessible. A classic example is the evolution of a fourth cusp in the mammalian tooth. This trait permits a vast increase in the range of foodstuffs which can be fed on. Adaptive radiations often occur as a result of an organism arising in an environment with unoccupied niches, such as a newly formed lake or isolated island chain. The colonizing population may diversify rapidly to take advantage of all possible niches. In Lake Victoria, an isolated lake which formed recently in the African rift valley, over 300 species of cichlid fish adaptively radiated from one parent species in just 15,000 years. Adaptive radiations commonly follow mass extinctions: following extinction, many niches are left vacant. A classic example of this is the replacement of the non-avian dinosaurs with mammals at the end of the Cretaceous, and of brachiopods by bivalves at the Permo-Triassic boundary. Survival of the fittest was first used by British philosopher Herbert Spencer. Then it was used by Charles Darwin. Herbert Spencer first used the phrase after reading Charles Darwin’s On the Origin of Species. He used this term in his Principles of Biology (1864). He drew parallels between his own economic theories and Darwin’s biological ones. He writes that this survival of the fittest is expressed in mechanical terms. Darwin called ‘natural selection’, or the preservation of favoured races in the struggle for life. Darwin first used Spencer’s new phrase “survival of the fittest” as a synonym for natural selection in the fifth edition of On the Origin of Species, published in 1869. Darwin meant it as a metaphor for “better adapted for immediate, local environment. It is not the common inference of in the best physical shape. Hence, it is not a scientific description. The phrase “survival of the fittest” is not generally used by modem biologists. This term does not accurately convey the meaning of natural selection. Natural selection refers to differential reproduction as a function of traits that have a genetic basis. “Survival of the fittest” is inaccurate for two important reasons. First, survival is merely a normal prerequisite to reproduction. Second, fitness has specialized meaning in biology different from how the word is used in popular culture. In population genetics, times; refers to differential reproduction. “Fitness” does not refer to whether an individual is “physically fit” — bigger, faster or stronger — or “better” in any subjective sense. It refers to a difference in reproductive rate from one generation to the next.An interpretation of the phrase “survival of the fittest” to mean “only the fittest organisms will prevail. It is not consistent with the actual theory of evolution. Any individual organism which succeeds in reproducing itself is “fit” and will contribute to survival of its species, not just the “physically fittest” ones. A more accurate characterization of evolution would be “survival of the fit enough”. “Survival of the fit enough” is also emphasized by the fact that while direct competition has been observed between individuals, populations and species, there is little evidence that competition has been the driving force in the evolution of large groups. For example, between amphibians, reptiles and mammals; rather these animals have evolved by expanding into empty ecological niches. Early organisms: First organisms were appeared about 3.8 billion years ago. At that time, there was no free oxygen. It was a “reducing atmosphere” composed of methane, carbon dioxide, ammonia, and hydrogen. The microorganisms of this period utilized methane or hydrogen rather than oxygen in their metabolism. Therefore, they are called as “anaerobic” (non­oxygen-using). First prokaryotic cells: Up to 700 MYA, life remained fairly primitive; the distinctions between plants and animals were not very clear-cut. For example, bacteria (monera) show a variety of forms. Some take in chemicals and depend on atmospheric CO2, like plants (autotrophs). Others take in organic material for food,like animals (heterotrophs). Some autotrophic bacteria, called chemosynthetic, do not need light; they obtain their energy from mineral chemical reactions, such as the conversion of sulfur to sulfate or the production of CH, Among the multitude of micro­organisms. Two bacteria become the major components for the further development of the living world. The mitochondria are the sites of the principal oxidation reaction linked to the assembly of ATP, which supplies energy to most of the organisms today. Their closest relative among present-day bacteria have been identified to be the alpha-proteobacteria. The chloroplasts are the agents of photosynthesis in unicellular algae and plants. They store the solar energy in the form of glucose (sugar), which becomes food for the “heterotrophs”. Their present-day relative are the cyanobacteria (formerly known as blue-green algae), which is believed to be responsible for the first generation of atmospheric oxygen. The chloroplasts supply food and oxygen for the heterotropic organisms, which in turn produced CO2 for photosynthesis. This ecocycle generates a lot of atmospheric oxygen today. Evolution of eukaryotic plant cell: Then evolution took another step toward complexity about 1.5 billion years ago. The bacteria acquired a nucleus and advanced to eukaryotic cells (protista). Subsequent fusion with mitochondria generated cells ancestral to those of animals and fungi. Acquisition by cyanobacteria in yet another round of fusion launched the photosynthetic protists and plants. It took a long time for plants to develop proper roots and vascular system for land dwelling. These carry water drawn through roots to all parts of their bodies – as well as taller, stiffer bodies that can evolve into ferns and trees. They would evolve ways of reproducing in the absence of water. They develop ovaries, producing ova, or eggs that are fertilized by pollen and develop into embryos within protective bodies. Plants depend on insects for reliable transfers of pollen, while wind, birds, and other animals scatter their fertile seeds. By the Ordovician period, shallow sea covered large areas of the world. Then the primitive plants such as Boiophyton Pragense had begun to adapt themselves to life on the relatively dry land. Boiophyton had already developed a stiff stem to hold it upright against gravity. It was vascular. It had developed a system of vessels or tubes to carry water through its body Many Devonian plants were seedless. Fern bear interesting traces of their origins. They produce no seeds but rather spore cells that fall to the soil and grow into a peculiar intergeneration plant that is not a leafy fern but a specialized fungus-like form that produces egg cells and sperm cells. Propelled by its whip-like tail, the sperm must swim a short distance through the water of moist soil to fertilize an egg cell from a neighboring plant. The fertilized egg then grows into a mature fern that produces more spores. It is as if the fern is an amphibian plant, growing on land but reverting to water to transmit its gametes.